When Karl Capek, the famed Czech playwright, wrote the play ‘R.U.R’ (Rossum’s Universal Robots) in 1920, introducing the word “robot” to the English language, the idea of a synthetic human was dystopian. And, frankly, most fictional depictions of robots since then have not been kind; C3PO and R2D2 being notable exceptions. But, robots are more likely to be mechanical or software-controlled agents today – helpers that are reliable and functional, not diabolical. Even with the threat of technological displacement or unemployment, humans still marvel at how our lives are enhanced and even saved by technology. We have lived with robots, digital assistants, and avatars for years, and the more we outsource our brains and our memories to the likes of Apple, Google, Facebook, and Amazon, we gain greater facility to personalize and even interact with our technology. 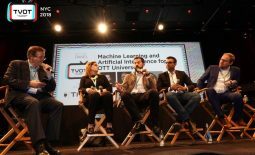 This has been part of a growing shift that places greater technological emphasis on interfaces that rely on machine learning, AI (artificial, or augmented, intelligence), natural language processing, and other advances that pass the Turing test. 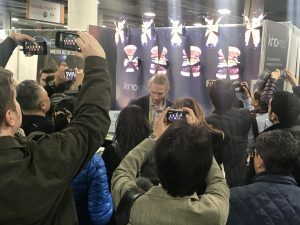 CES 2017 put robots at center stage in ways that we can now accept, and Chris Pfaff Tech Media was there to take it all in over an intense 6-day period. These virtual, and even mechanical, assistants are baked into experiences that can develop habits for humanity. While many pundits were touting this year’s show as “the Alexa show,” intelligent systems were predominant in ways well beyond ASR (atomatic speech recognition). Intel’s RealSense was on display again this year, with a drone camera demo that was part of the latest “hero demo” in which a single human had powered a 500-drone flight. The drone-camera demo was part of Intel’s attempt to show how RealSense can automate the process of shooting/plotting information via drone. 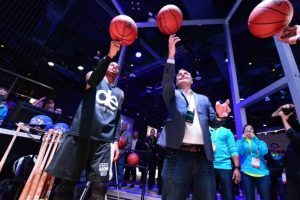 Intel also showed off its Curie processors, and the new Quark SoC (system-on-a-chip) with high-flying dunkateers from Dunk Elite, a London-based team of acrobatic dunk artists, which captured a myriad of body measurements and sports data. Intel also showed off its latest acquisition, Voke VR, which conducted a live VR streaming demo over an AT&T 5G demo network, with Ericsson. For some, this was a bit of a thin demo: Intel and Ericsson’s booths were seprated by a mere 10 meters. 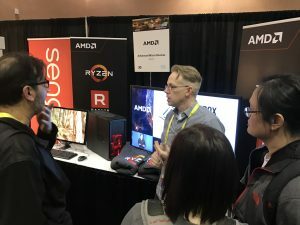 AMD provided some competition in the chip space, showing off its new Ryzen processor, which rivals the Intel Core i5 7600K. This is impressive, particularly in the gaming space, which should heat up this year. Some estimates show the eSports market rising to a cool $9 billion. Qualcomm, as always, had a huge presence at the show. They featured three booths, with the largest in the central hall touting IoT concepts, and VR/AR. Qualcomm’s new Snapdragon 835 processor was featured. This new chip is all about VR; Qualcomm is touting greater depth and lower power (it boasts that the 835 is part of the first commercial 10 nanometer chip fab process). 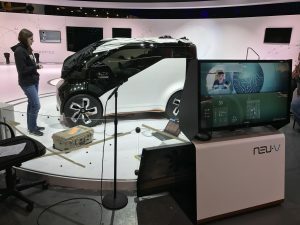 Qualcomm also had a booth in the North Hall touting its car platform; the company’s 2016 acquisition of NXP has vaulted it into the front ranks of connected car chip companies. 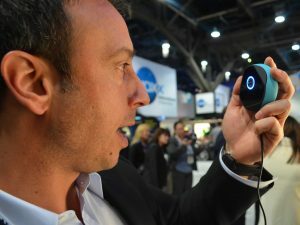 Other intelligent systems and products came from the likes of DISH Networks, which probably won most heroic demo on the show floor: a voice-activated Hopper that controls your EPG and records shows for you. 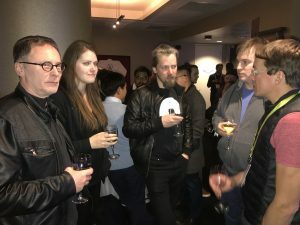 The fact that the demo was done in a suite that was not sound-proofed, and took in lots of ambient show floor noise, made the Alexa integration all the more impressive. Samsung showed off its SmartThings hub, with voice-activated technology from its Viv acquisition. The big boys, Samsung and LG, went at it again this year in stunning one-upmanship. For the record, Samsung won the product battle. 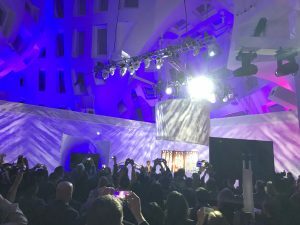 Its QLED displays were introduced at a pretty spectacular event at the Keep Memory Alive Center in downtown Las Vegas. The Frank Gehry-designed building, part-temple/part ocean-going vessel design, provided the ideal backdrop for Samsung’s roll-out of its latest OLED displays, which have a wider viewing angle, greater contrast/brightness (1500-2000 nits), and a wide color gamut (WCG) that actually encompasses the full range of the human eye. It has a flush mounting system with a single fiber connection to an external input box (smart idea). It was an amazing event, and it was a total display geek-out for someone like me. My old Sharp LCD client, Joe Stinziano, was there doing God’s work, as were dozens of other Samsung technical and sales/marketing execs. 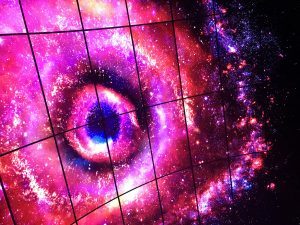 Samsung’s branding of QLED (a play on its quantum dot crystal structure) extended the “Q” prefix to other products. This was a huge play for Samsung, which is rebounding from its spectacular Galaxy Note 7 disaster. 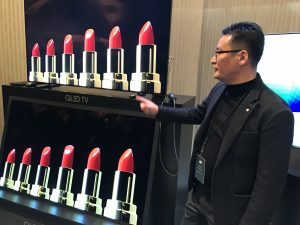 The QLED products go on sale next month. LG, meanwhile, won the battle of the display content. 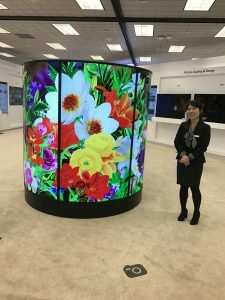 This is not news to anyone who has been to these booths the past few years, but LG upped the ante this year, with a full, immersive content “room” that made one feel as if they were in an aquarium or a planetarium. 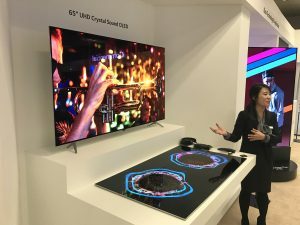 LG Display gave us a private demo of its latest products, which included the world’s thinnest (1 millimeter) display, and introduced its Crystal OLED Sound technology (clever integration of speakers in the actual display), which has already been used by Sony in its latest TV. 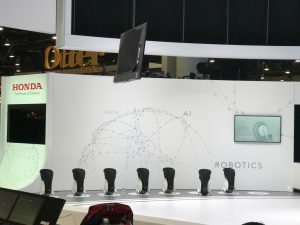 Other impressive products and/or displays included EyeLock’s retina detection system (tucked away in a prominent corner of the palatial Voxx booth), and Bosch’s APAS system, the first assistance system certified for use with human operators. Bosch used APAS robots to serve coffee, among other tasks, in its massive booth, just in front of the Samsung booth. The North Hall of the Las Vegas Convention Center, though, was the real show this year. 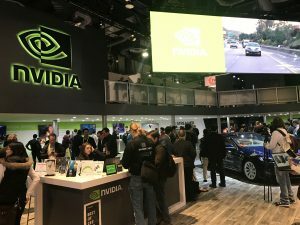 For the second time, a car was introduced at CES. This year, it was Faraday Future’s FF91. This impressive vehicle, the progeny of much-questioned Faraday Future, owned by Chinese conglomerate Le Eco, showed off a 1000 horsepower all-electric powertrain which can travel more than 370 miles per electric charge. The built-in LiDAR and more than 30 cameras, radars, and ultrasonic sensors are augmented by a smart app that parks the car for you and can bring it to you from parking, as well as facial recognition for unlocking the car. All of this can be had for a mere $5,0000 reservation fee. Le Eco has some new funding, apparently, so we may yet see these beauties on the road this year. Stay tuned. Meanwhile, the real car companies showed off quite a lot. 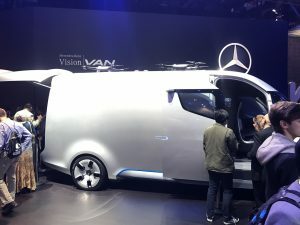 Mercedes-Benz showed off its mouthful of a corporate mantra, CASE (Connected, Autonomous, Shared, Electric), with the Mercedes Electric Intelligence platform, which was represented by a concept car, EQ, which uses solar energy stored at home, and wireless charging. The hippest car at the show, though, was the Mercedes Vision Van, a new delivery/sprinter van that has two drones on top, and is driverless. Mercedes also announced that it would launch its driverless freight truck, the Daimler Freightliner, by 2025. Honda was back at CES for the first time in years, showing off its ‘Cooperative Mobility Ecosystem.’ This included a motorcycle that has riding assist, self-balancing features, and autonomous operation (i.e., it can be called by the river). Honda showed off the way-cool NueV concept car – an electric vehicle for ride sharing that has an “emotion engine” and charges itself at the lowest rate times. The Honda Uni-Cub (best known for their use in the latest OKGO music video), a seated Segway-type transport vehicle, was a bit hit. it moves via body control/leaning. Fiat Chrysler was one of many companies that showcased its work with Google’s Waymo spin-out, a driverless car ride sharing service, which will heavily feature the Chrysler Pacifica cars. 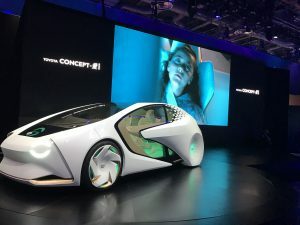 Toyota, again, showed off the coolest concept car at the show, which featured an excellent emotion detection platform. 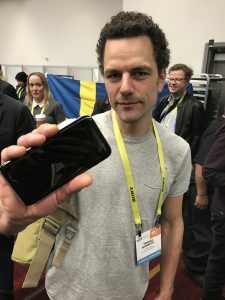 While 5G was a big technology looming over the show, not much was shown. AT&T, which holds its annual developers forum just prior to the start of CES, claimed that 2017 would be the year of video on its network. 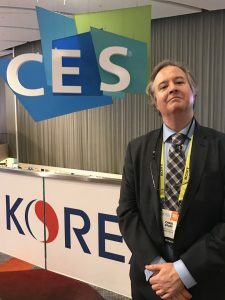 It has already planned major 5G trials this year, with video a major feature, and preliminary speeds of 1 Gb/s in initial trials. International delegations were quite prominent this year, but mostly for the massive Chinese presence, with ZTE, Huawei, DJI, TCL, Hi-Sense and Honor as major sponsors and exhibitors. 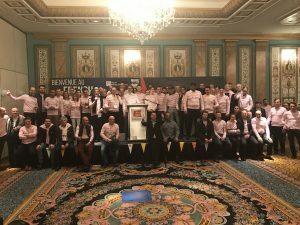 The French delegation outdid itself, again, and Eureka Park was practically a French tech zone. The Swedish delegation was stronger than ever, and several Swedish start-ups, notably Manomotion, made their presence felt. I caught up with members of the “Estonian Mafia” at the show, including the only Estonian company exhibiting at the show, Starship Technologies, which has some pretty cool delivery robots (I got a demo when I was in Tallinn last September). Starship just announced, post-CES, a major funding round of $17.2million, with Daimler AG as the lead investor. 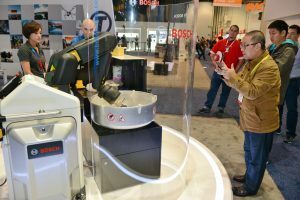 Eureka Park was bigger than ever this year – 600 exhibitors, up from 500 at CES 2016. Kino-mo had another way-cool display, with Pokemon Go figures, and there were more funded companies, it seemed, than in previous years. The robots could have helped the ride-sharing queues that created Lyft and Uber traffic jams outside the convention center. This was unfortunate, but will require more than robots to solve the crisis: political leadership (Las Vegas not known for its progressive thinking where non-gamblers are concerned). Until next year, go out and buy an Amazon Echo, or the many equivalents, and find new ways to integrate AI into your life. In other words, help a robot brutha out.